River channels are dynamic landforms that play an important role in regulating riparian ecosystems. At a fundamental level, river erosion and deposition produce changes in the riparian zone that lead to the creation of new habitat or reworking of existing habitat. Despite considerable riparian research along the Oldman River in southern Alberta, little is known about historical channel dynamics and the resulting implications for riparian habitat. 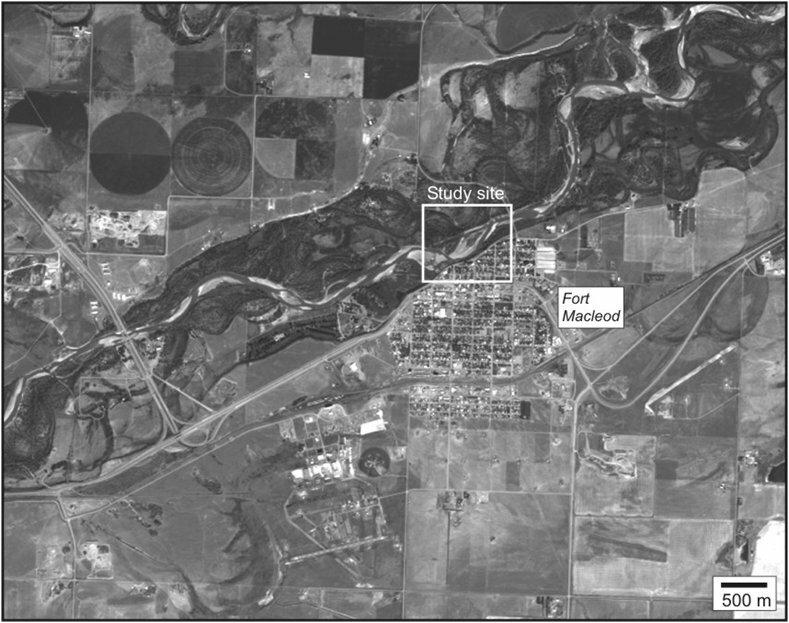 This research paper documents long term dynamics of a segment of the Oldman River at Fort Macleod, AB. Specifically, historical aerial photographs and a ground penetrating radar (GPR) were used to reconstruct how the river channel and bar features evolved over the last 70 years. Results from the aerial photographs indicate that the channel has undergone pronounced changes since 1938, with a trend of increasing meander curvature and decreasing wavelength. Channel bank reinforcement at Fort Macleod will likely constrict further meander development and force continued downstream meander migration. Subsurface imaging of a channel bar with GPR reveals a dominant mode of vertical accretion by bedload deposition at high flow stages, indicating a compound feature formed by overlapping unit bars. Observations of other bars along the Oldman River indicate similar modes of emplacement. Overall, results from this case study provide important context for assessing recent changes in riparian habitat. Application of this approach to other river segments will be of value in assessing whether similar patterns of channel and bar dynamics exist throughout the Oldman watershed. Combining GPR and historical aerial photographs to investigate river channel morphodynamics, Oldman River, southern Alberta . Labey, Katie , St.Pierre, Heather , Sundsten, Jennifer , Seaman, Oliver . Lethbridge Undergraduate Research Journal. Volume 4 Number 1. 2009. Erosion and deposition along river channels lead to changes in the riparian ecosystem through the creation of new habitat or reworking existing habitat. The Oldman River of southern Alberta is well known for its unique riparian ecology, yet little is known about the dynamics of the river channel and allied depositional bars. Documenting the morphodynamics of channel bars is valuable when assessing riparian zone dynamics because it tells us about the geomorphic (process-form) context of the habitat [1, 2]. By documenting the internal structure and migration of channels and bars, it is possible to develop a more comprehensive understanding of how the riparian habitat evolves. Channel and bar development are largely controlled by river competence, power, velocity, and the availability of sediment at high discharge [3, 4]. Channel bars define a wide range of sedimentary bedforms that can be divided into different groups based on the channel pattern. For example, alternate bars are commonly associated with straight channels, point bars at the inner banks of meander lobes, and braid bars in braided channels [4, 5]. Previous research has demonstrated how the overall pattern of channel and bar development controls the pattern of riparian vegetation [2, 6, 7, 8]. To date, little research has been conducted on the geomorphology of the Oldman River, or gravelly meandering rivers in general . We adopt a similar approach to that of Wooldridge and Hickin (2005), whereby channel and bar dynamics are investigated through aerial photographs and ground penetrating radar (GPR). The latter is a geophysical technique that images subsurface features with electromagnetic energy. By integrating GPR and aerial photographs, Wooldridge and Hickin (2005) were able to associate alluvial architecture, sediment transport, and bar formation over a period of 50 years . Our study had two main objectives: (1) to describe and define the morphodynamics of a compound bar using GPR and historical aerial photographs; and (2) to construct a relative chronology of deposition and determine the primary formative processes. By understanding the processes driving channel bar formation and maintenance we aim to provide useful information for management and conservation efforts in gravelly, meandering rivers, with particular implications for poplar forests in the riparian zone of the Oldman River. The Oldman River is a meandering, gravel river flowing east from the Rocky Mountains to the South Saskatchewan River. It has an average discharge of 95 m3/s and has its highest rate of flow between the months of May and June. Significant floods occurred in 1975, 1995, and 2005. Historical channel development has affected how alluvial sediments such as gravels, sands, and clays are deposited . 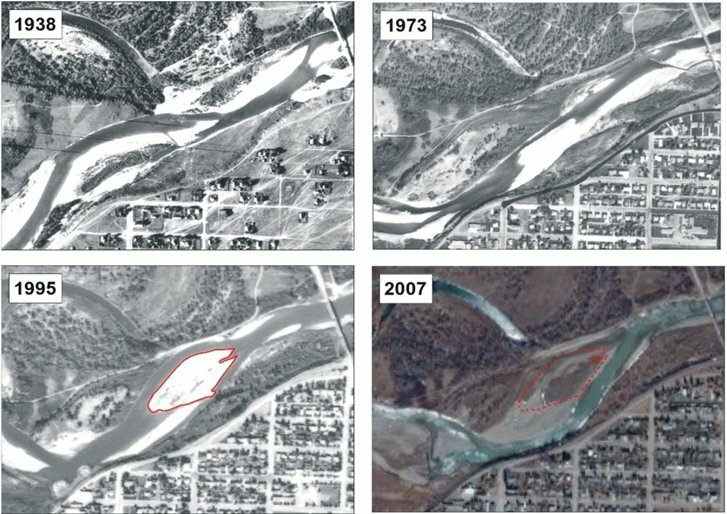 From the Oldman River Dam to Fort MacLeod there is a change in geomorphic context (Figure 1). The floodplain near the dam is confined by valley marginal bedrock, while Fort MacLeod is characterized by a wide floodplain of alluvial deposits . Topographical controls such as the reinforced banks at the town of Fort MacLeod have restricted the channel diversity of the Oldman River. This has direct impact upon the dynamics of the Oldman River channel, and the riparian ecosystem. Southern Alberta is characterized by a dry sub-humid climate regime with frequent occurrences of stable, high pressure systems. The regional geology of the area consists of coarse glaciofluvial deposits, till and glaciolacustrine silts . Many of these deposits are exposed in valley-side exposures. Bedrock outcrops are also common in the upper reaches of the Oldman River. The channel segment investigated during this study is located north of the town of Fort Macleod (Figure 1). The bar is approximately 0.5 km long by 0.2 km wide. Half of the bar is stabilized by vegetation. The un-vegetated, active portion of the bar consists of large cobbles and gravel on the southwest side, with decreasing sediment size in the direction of flow over the bar to the northeast. Figure 1: Location of study site along Oldman River at Fort Macleod. Aerial photographs and satellite imagery were used to document channel dynamics from 1938 to 2007. Three aerial photographs (1938, 1973, and 1995) and one QuickBird multispectral satellite image (2007) were examined. All three photographs were taken during the month of September. The aerial photographs were converted to digital images by scanning at 300 dpi. The digital images were then geometrically rectified to a common geographic reference system using ArcGIS v. 9.2 software. A minimum of ten tie-points were used to match images and allow for accurate comparison of channel and bar changes over time. Channel center lines were digitized for each image to show the degree of channel migration in the intervals between images. GPR profiles were collected on the un-vegetated, active portion of the bar to document the three-dimensional sedimentary architecture and thereby infer depositional processes. GPR is a non invasive, shallow subsurface technique that uses electromagnetic waves to image subsurface interfaces . Results of GPR surveys are used to characterize internal structures that represent specific depositional processes. GPR data also reveal a relative chronological evolution of the channel bar through the vertical representation of sedimentary structures. A Pulse Ekko 100 GPR system (Sensors & Software Inc.) with non-shielded antennae (both 100 and 200 MHz antennas) was used. The antennae were fixed 1 m apart on a plastic sled and moved both perpendicular and parallel to the profile. There was a step spacing of 0.22 m and trace stack of 2048. The latter is used to clean the data by averaging multiple transects. The velocity of the radar waves was determined to be 0.1 m/ns. This allows for estimates of the depth to certain radar reflections in the subsurface. GPR surveys across the bar surface consisted of thirteen transects (Figure 2). Transects were oriented to characterize flow-normal and flow-parallel structures. In order to avoid frequency-dependent radar interpretations [10, 12], the subsurface was imaged with two antenna frequencies (100 and 200 MHz) to allow GPR profiles of the same strata to be interpreted at two different scales. This process of interpretation redundancy aids in identifying the subsurface architecture . The 100 MHz GPR profile provided greater penetration depth than the 200 MHz profile, but with lower resolution. Therefore, for the best resolution, we focused on the 200 MHz data for all GPR interpretations. Figure 2: Layout of the thirteen line data acquisition run with GPR. Arrow heads point in direction of the transect line. Direction of flow is from southwest to northeast. Rectified aerial photographs and satellite imagery provide evidence that the Oldman River channel near Fort Macleod is very dynamic (Figure 3). Only one bar feature was present from one image to the next (indicated with a red outline in Figure 3), suggesting there is constant re-working of most river sediment within the system. This may provide the necessary conditions for the aggradation and subsequent degradation of the numerous channel bars (both unit and compound bars) present at this site. Figure 3: Aerial photographs (1938, 1973, 1995) and the QuickBird multispectral satellite image (2007) of the channel bar in the Oldman River, Alberta, taken in September of each year. The bar outlined in 1995 is superimposed on the 2007 image. Direction of flow is from southwest to northeast. In 1938, this section of the Oldman River was most characteristic of a straight channel with alternate bar formations. The subsequent images (1973, 1995, and 2007) are distinguished by the meandering nature of the channel seen presently (i.e., 2007), with many compound bar formations. One bar in particular, visible as an exposed area in the 1995 photograph, may form the foundation of the stabilized (vegetated) component of the current bar as visible in the 2007 image (Figure 3). The overall pattern of channel change apparent from the centerlines consists of increasing meander curvature and decreasing wavelength (Figure 4). This indicates that the channel has transformed from a relatively straight segment in 1938 to a more meandering form at present. It is unlikely, however, that this form will persist since the channel banks along the south side at Fort Macleod were recently (ca. < 1995) armored and reinforced with large boulders to prevent bank erosion. The latter will likely constrict further meander development by limiting erosion and thereby force continued downstream meander migration. 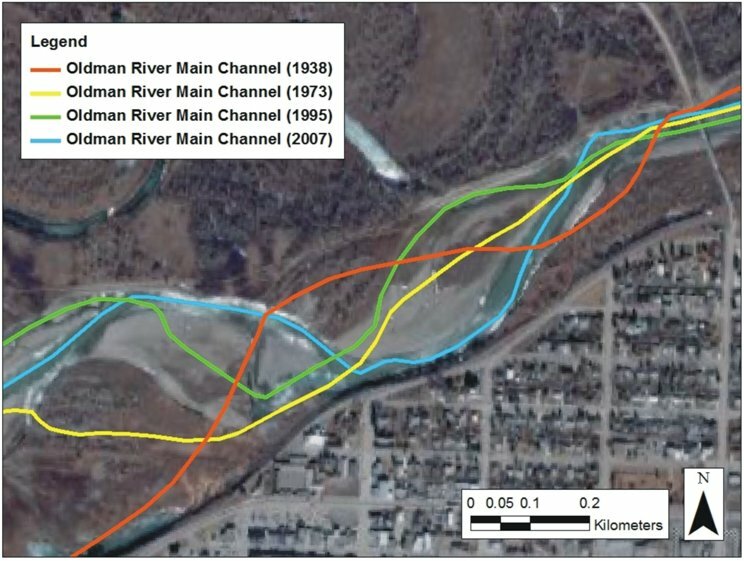 Figure 4: Channel change along a portion of the Oldman River near Fort MacLeod. Colored lines depict channel centerlines for each year: 1938 (orange), 1973 (yellow), 1995 (green), and 2007 (blue). Direction of flow is from southwest to northeast. GPR profiles reveal a variety of reflections that are interpreted as primary sedimentary structures (Figure 5). Between 4.0-6.0 m of depth, a continuous reflection is identified that might represent the base of the bar (Figure 5A). Below this reflection the signal is largely attenuated, suggesting the presence of conductive material. The latter probably corresponds to fine-grained lacustrine sediment deposited during deglaciation. Gravel pits near the channel bar are underlain by lacustrine silts, further supporting this interpretation . Numerous downstream dipping reflections are present in flow-parallel GPR profiles (Figure 5A). These likely represent the downstream accretion of the bar, characterized by migrating bedload sheets. Bedload sheets are low-amplitude, relatively planar features, up to 1 m thick, composed of normally loose sediment . The subparallel nature of the bedload sheets may be attributed to the intermittent nature of bedload transport in the channel. Bedload sheets overtake and bury other sheets, producing the numerous dipping reflections common to this complex bar formation . A common technique to summarize GPR profile data is to define consistent patterns of reflections called radar facies. Radar facies are mappable, 3D units composed of reflections whose internal reflection configuration (e.g., shape, orientation), continuity, amplitude, polarity, spacing, and external 3D geometry differ from adjacent units . Three dominant radar facies are apparent in the GPR profiles (Figure 5). In addition, one radar element is identified in flow-normal GPR profiles. Radar elements combine closely related facies into facies associations, and are characterized by the facies assemblage, their external form, and internal geometry . One radar element is presented from Line 9 (Figure 5B). Description. Radar facies 1 (RF1) is distinguished by stacked (~ 0.2 m to 1.0 m thick), horizontal to subhorizontal, continuous (~18 m long), parallel to subparallel reflections (Figure 5A). RF1 reflections are present at variable depths and may act as bounding surfaces for other radar facies (i.e. RF2 or RF3). Interpretation. The RF1 reflections described here are interpreted as vertically accreted sheets deposited from migrating bedload sheets across the bar surface. The regular stacking of these layers is characteristic of simple addition to the bar via vertical accretion of sediment [10, 14]. The prevalence of this depositional form could be attributed to frequent flood conditions in the Oldman River. Description. Radar facies 2 (RF2) consists of short, subparallel, low- to medium-angle, apparent dipping reflections (Figure 5A). RF2 reflections commonly terminate against RF1 reflections acting as bounding surfaces. Interpretation. The RF2 reflections outlined here are interpreted as small-scale downstream accretion of sediment, which could be a mechanism for the downstream advancement of the bar. RF2 reflections may result from the movement of bedload sheets creeping over the slip-face of unit bars or other features on the surface of the bar. Description. Radar facies 3 (RF3) consists of long, subparallel, low- to medium-angle, apparent dipping reflections (Figure 5A). RF3 reflections commonly terminate against RF1 reflections acting as bounding surfaces. Interpretation. The RF3 reflections outlined here are interpreted as large-scale vertical and downstream accretion (aggradation) of sediment. RF3 reflections may result from the migration of bedload sheets over the bar margin and are likely a more significant contributor to the vertical and downstream accretion of the bar than RF2 reflections. Description. Radar element 1 (RE1) is characterized by bounding, concave-up reflections that tend to truncate adjacent reflections (Figure 5). RE1 is present at variable depths and consists of variable lengths (~ 8 to 84 m). Interpretation. RE1 reflections described here are interpreted as chute channel deposits bounded by erosional, concave-up channel edges. Chutes and shallow channels that cut across the bar (10) are also evident in the aerial photographs and satellite imagery. This provides further support that the channel fill observed in RE1 may have developed from the infilling of chutes. Figure 5: A: Flow-parallel GPR transect (Line 8, 200 MHz) showing RF1, RF2, and RF3. B: Flow-normal GPR transect (Line 9, 200 MHz) showing RE1 (radar element is highlighted in red). Analysis of the aerial photographs and GPR profiles reveals a complex history of the channel and bar at Fort Macleod. Between 1938 and 2007 the channel underwent dramatic change, in many cases erasing all signs of earlier features. Results from the aerial photographs can be summarized by two key characteristics: (1) a trend of increasing meander curvature and decreasing wavelength with downstream meander migration; and (2) the relative youth of the channel bar imaged with GPR (new since 1995). The downstream migration of the meander appears to be a response to restriction imposed by the armoring of banks at Fort Macleod. Since the channel cannot cut through this coarse, resistant material, it has been forced to migrate downstream instead. In addition, channel sediments from previous bars (visible in 1938, 1973, and 1995) are not likely responsible for the present compound bar formation. The aerial photographs indicate that most, if not all, reflections in the GPR profiles are sedimentary structures that formed between 1995 and 2007. The deposition of new sediment via vertical accretion by migrating bedload sheets may have formed this new bar feature. From the GPR data, it is possible to identify the dominant depositional features controlling the development of the channel bar. The GPR profiles primarily reveal vertical and downstream accretion elements of the channel bar. The most common radar facies (RF1) is distinguished by continuous, stacked, horizontal to subhorizontal, parallel to subparallel reflections. These are interpreted as vertically accreted deposits from migrating bedload sheets overriding the bar surface. Wooldridge and Hickin (2005) and Hugenholtz et al. (2007) have reported similar deposits using GPR in gravel-bed rivers. Many deposits of ancient and modern gravelly-meandering rivers also exhibit horizontal, parallel strata, indicating the dominant contribution of bedload sheets to bar development [9, 15]. In the context of riparian ecology, it is important to note that our data suggest a complex history of habitat changes near Fort Macleod, particularly in the context of cottonwood seedling recruitment . Our data reveal a highly dynamic channel segment characterized by substantial erosion and deposition within the 70 year timeframe encompassed by the aerial photographs and satellite imagery. Channel bars are also shown to be highly mobile features, providing little time for cottonwoods to colonize and establish within the active channel. Thus, opportunities for riparian vegetation to establish on bars of the Oldman River at Fort Macleod are limited by frequent disturbances associated with erosion and deposition of channel sediment. This project was completed as part of an undergraduate course at the University of Lethbridge (Geography 3035: Fluvial Geomorphology). The assistance of Dr. Chris Hugenholtz is gratefully acknowledged for providing access to the GPR and software, funding, and editorial suggestions. Field and technical assistance by Chris Stevens (University of Calgary) is gratefully acknowledged. Dr. Stephen Wolfe of the Geological Survey of Canada kindly provided the aerial photographs. Katie Labey: I am currently in my fifth year of a B.Sc. General Science with streams in Physical Geography, Physics and Neuroscience. I would like to thank the members of this group for their hard work and dedication to this research project. I also would like to extend my thanks to Dr. Chris Hugenholtz for his wealth of knowledge and encouragement throughout this project. Heather St.Pierre: Originally from Edmonton, Alberta, I am currently in my third year of a B.Sc. Geography degree with a concentration in Geographical Information Systems with the University of Lethbridge. I would like to my thanks to Dr. Chris Hugenholtz for all of his help with this project and for giving us the opportunity to take this project to its maximum extent. I would also like to thank my group members for their contributions, hard work, and dedication to the completion of this project. Jennifer Sundsten: I am currently in my fourth year of a B.Sc. Environmental Science degree at the University of Lethbridge and plan to graduate with a Co-operative Education designation in April 2009. I have been an active member of the University of Lethbridge Rotaract Club for three years and am an avid supporter of local and international community service initiatives on campus. Oliver Seaman: From the Foothills of Alberta, I recently received my Bachelor of Science in Geography after four years at the University of Lethbridge. I would like to thank Professor Chris Hugenholtz for tirelessly assisting our ultimate goal of having the paper published. Also, I would like to thank my group for an interesting, constructive and enjoyable project. 1. Rood, S. B., Taboulchanas, K., Bradley, C. E., & Kalischuk, A. R. (1999). Influence of flow regulation on channel dynamics and riparian cottonwoods along the Bow River, Alberta. Rivers, 7(1), 33-48. 2. Wilms, C.R., Pearce, D.W., Rood, S.B.(2006). Growth of riparian cottonwoods: a developmental pattern and the influence of geomorphic context. Trees, 20; 210-218. 3. Bridge, J. S., Alexander, J., Collier, R., Gawthorpe, R.L., Jarvis, J. (1995). Ground- penetrating radar and coring used to study the large-scale structure of point-bar deposits in three dimensions. Sedimentology, 46(6) : 839-852. 4. Sridhar, A., & Patidar, A. (2005). Ground penetrating radar studies of a point-bar in the Mahi River Basin, Gujarat. Current Science 89(1) : 183-189. 5. Knighton, D. (1998). Sediment Deposition. In Fluvial Forms & Processes: a New Perspective. Oxford University Press: New York; 141. 6. Bradley, C., Smith, D.G., 1984. Meandering channel response to altered flow regime: Milk River, Alberta and Montana. Water Resources Research 20(12): 1913-1920. 7. Mahoney J.M., Rood S.B. (1998). Streamflow requirements for cottonwood seedling recruitment: An integrative model. Wetlands, 18 : 634-645. 8. Rood, S. B., Kalischuk, A. R., & Mahoney, J. M. (1998). Initial cottonwood seedling recruitment following the flood of the century of the Oldman River, Alberta, Canada. Wetlands, 18(4), 557-570. 9. Kostic, B., Aigner, T. (2007). Sedimentary architecture and 3D ground-penetrating radar analysis of gravelly meandering river deposits (Neckar Valley, SW Germany). International Association of Sedimentologists 54 : 789-808. 10. Wooldridge, C.L, Hickin, E.J. (2005). Radar architecture and evolution of channel bars in wandering gravel-bed rivers: fraser and squamish rivers, British Columbia, Canada. Journal of Sedimentary Research 75: 844-860. 11. Shetson, I., (1980) Sand and gravel resources of the Lethbridge area. Earth Sciences 81(4) : 1-41. 12. Woodward, J., Ashworth, P.J., Best, J.L., Sambrook Smith, G.H, and Simpson, C.J., (2003). 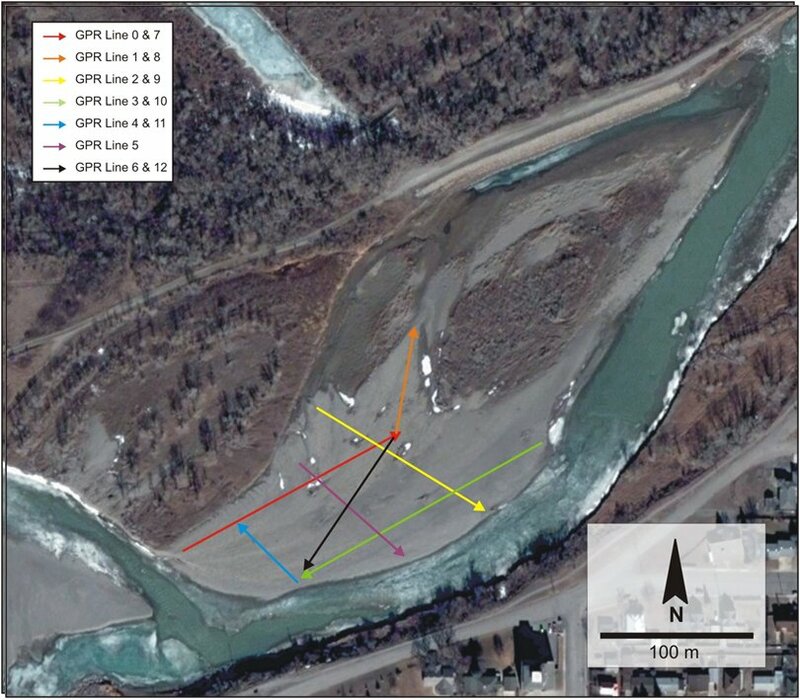 The use and application of GPR in sandy fluvial environments: methodological considerations. Geological Society of London, Special Publication 211 : 127-142. 14. Mumpy, A.J., Jol, H.M., Kean, W.F., Isbell, J.L. (2007). Architecture and sedimentology of an active braid in the Wisconsin River based on 3-D ground penetrating radar. The Geological Society of America, Special Paper 432 : 111-131. 15. Hugenholtz, C.H., Paulen, R.C., Wolfe, S.A, (2007). Ground-penetrating-radar investigation of relict channel bars of the Meander River spillway, northern Alberta; Geological Survey of Canada, Current Research 2007-A1, 10 p.
16. Bridge, J.S., (2003). Rivers and Floodplains: forms, processes, and sedimentary record. Blackwell, 491 p.